Worn out tuners can make tuning a mandolin difficult, especially if you have to lock a pair of Vice grips around the shaft to turn it. Other sources of frustration are sloppy/worn gearing that results in too little response from the shaft when turning the knob. Inexpensive tuners with poor gear ratio's do not permit small incremental adjustment and often have us tuning above the note we're aiming for with very little effort. If you can find retrofitting replacements for your mandolin this is normally a simple procedure. However, those who need to replace their tuners with a different style or brand may find that modifications are necessary for a proper fit. Enlarge/ream peghead holes to accommodate a larger post or ferrule size. For obvious reasons I would highly recommend choosing tuners with the same post to post spacing. Round gear above worm gear. 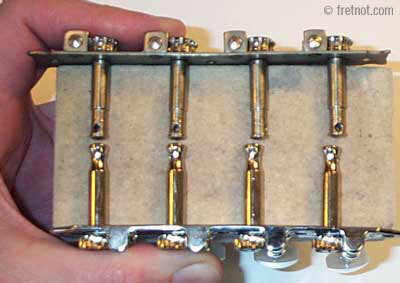 Plugging the holes in the peghead can require refinishing of the front and back side of the peghead, a major undertaking for a professional look. 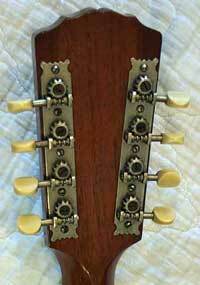 On some early Gibson mandolin tuners the round gear sat above the worm gear/ tuning shaft (see picture). After decades of tension and good ole wear and tear the strings tension can tilt the string post towards the fingerboard thereby slightly separating the round and worm gear. Poor coupling of these two gears can make tuning difficult as they begin to slip. This deign was later reversed and string tension on the tuning post actually drew the round and worm gear together. On some tuners it is possible to replace just the plastic tuning knob should it crack or break. Some vintage celluloid buttons suffer from what is often referred to as "shrunken heads", this condition is the result of the celluloid buttons shrinking to half of their original size. Replacement options are limited (but growing).